The Half Baked Lunatic | Are there any stable currencies left? Death and Taxes. Ok, just taxes. | What do you believe? Are there any stable currencies left? They can't seem to print money fast enough to keep up. 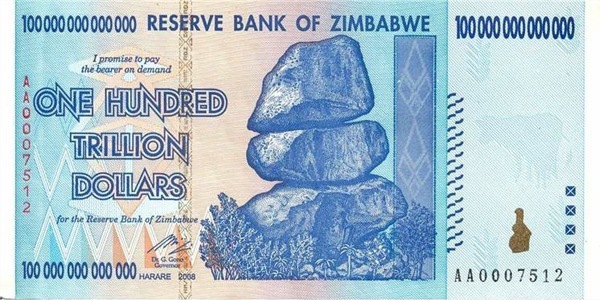 Previously, the largest bill was 50,000 Zimbabwe dollars, and now the new bill is Z$1,000,000, and they're still expecting currency shortages! I remember when South American countries were all in an economic free-fall back in the 90's. If you ate at a restaurant in Argentina, you needed to pay for your meal when you ordered, because if you waited until after you finished, the price will have doubled. And that's with an inflation rate of "only" a few thousand percent. How in the heck do you keep things "synchronized" from store to store with a 230 million percent inflation rate? It's ludicrous! Of course, this leads to the question of how stable the U.S. dollar is. 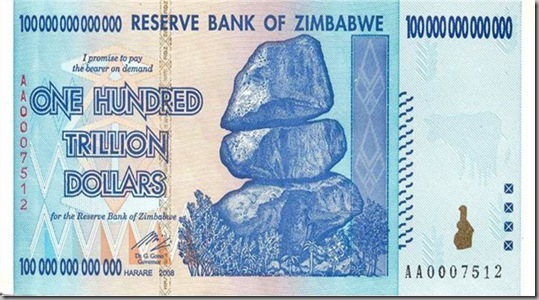 Are we headed for increased inflation and devaluation of the dollar? You betcha we are, no doubt about it. Probably not at the "hyper-inflation" levels we're talking about, but inflation is still inflation. It diminishes the value of any "cash based" assets, reduces earning power, and makes imported goods more expensive compared to domestic goods. Here's the problem. As the world's economies are all intertwined, all major currencies can fluctuate at the same time - and in the same direction. So it's possible to have a situation where you don't have a big change in import prices, and exchange rates won't vary noticeably, but everyone could still feel the diminishing value of cash based assets. Which begs the question, what is a stable benchmark to use? Gold? Gold based currencies? While it's true that gold does have an "intrinsic" value, it is also subject to supply and demand - and emotion. But yes, if the "value" of gold stays the same and currencies sink, then the "price" of gold appears to go up. Gold based currencies do tend to be more stable, but (as we've seen) they can be mis-managed as well. How about the "labor" based benchmarks? The theory is that rather than saying that the price of goods and labor has gone up, you assume that the value of labor is fixed but the price of goods, and currency, changes. Put it this way: will a days work will buy you and your family enough to eat and enough to live in a house, and if times are good then maybe you'll have enough left over to buy some non-essential items or take a vacation? It doesn't matter if the average exchange rate of labor for currency is one hour per dollar or .02 hours per dollar (or as you're used to seeing it stated: $50 dollars per hour). The problem with this benchmark is that it used to be that a family with a single wage earner could get by just fine. Now, everyone struggles to survive with two wage earners in a household. The root cause of this change is that technology has improved the effectiveness of labor - for the most part, labor is more efficient, so less of it is required. This manifests as less hours per acre of corn grown and less people needed to build a car. This steers more people towards office and professional work. I'm fanatical about efficiency and reduced waste, so I see this as a good change - but it invalidates the notion of using labor as a currency benchmark, as some economists still promote. What's the old saying? The only thing that's consistent is change. Something like that. I guess this applies to currencies as well as everything else.